Destinations Covered: New Delhi - Samode - Jaipur - Agra - Orcha - Khajuraho - Varanasi. The Tour ‘Taj Mahal with Central India’ gives you a chance to see the Real India. During this tour of Taj Mahal with Central India you will visit few of the best destinations, Monuments, forts and Palaces and temples of India. Day 01: Delhi: Welcome to India! On arrival, you will be met by our representative & transferred to hotel where we will be holding the rooms on ready occupancy basis. Overnight at hotel. Day 02: Delhi: In the first half of the day enjoy city tour covering India Gate, President’s house, Humayun’s Tomb, Qutab Minar, Laxmi Narayan Temple. After lunch enjoy city tour of Old Delhi covering Jama Masjid, Red Fort, Gandhi Memorial followed by sound & light show at Red Fort. Overnight at hotel. Day 03: Samode: In the morning drive to Samode in your exclusive vehicle. On your arrival to the Samode check in at your hotel (Samode Palace). Time free for leisure. In the evening move out for the camel ride. Rest of the time free to watch the cultural performance. is visible at even the most commonest places such as its squares and lanes. 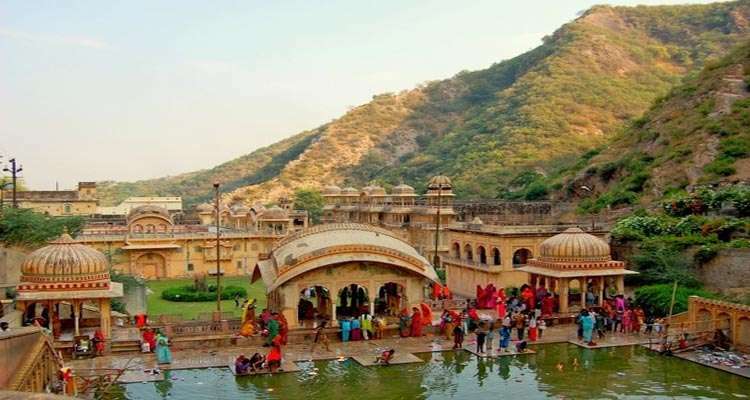 Day 05: Jaipur: Take a full day long sightseeing tour of Jaipur city that includes the City Palace, Jantar Mantar observatory, Hawa Mahal, Birla temple, Albert hall and excursion to the old capital Amber. Here at Amber, you’ll ascend till the gates of majestic fort on elephant back. The fort displays a beautiful mix of Mughal and Rajput styles of architecture. Optional trip to ethnic village resort where you may enjoy traditional Rajasthani dinner. Day 06: Agra: In the morning drive to Agra in your exclusive vehicle. Visit the well-preserved capital of Akbar- Fatehpur Sikri on the way. At Agra visit the incomparable Taj Mahal and Agra Fort. Orcha in your exclusive vehicle. Rest of the time free to explore on your own. Day 08: Khajuraho: After a leisurely breakfast you will be transferred to the Khajuraho. On arrival at Khajuraho Check in to your hotel. Later move out to have a guided tour of western group of temples. Rest of the evening free to relax. Day 09: Varanasi: Morning tour to Eastern group of outstanding temples. Board the flight for Varanasi. At Varanasi take a walking tour of a few Ghats and narrow backlanes to feel the pulse of this most sacred city of India. Day 10: Varanasi: Early morning boat ride on river Ganges to witness holy rituals on Ghats. A very spiritual experience! Half day tour to Sarnath where Buddha delivered his first sermon. Rest of the time completely for leisure. Day 11: New Delhi: Fly to New Delhi. On arrival you will be received and transferred to the your hotel. At New Delhi, evening to be used in shopping and visiting the local bazaars. Day 12: New Delhi: At appropriate time you will be transferred to the international airport to board the flight back to home. (The Tour Ends).